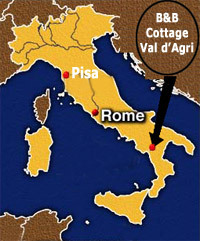 The Val D’Agri Bed and Breakfast Cottage is a country house framed by over 10 hectares of forest property and immersed deep within the natural surroundings of Castiglione, one of Potenza's most scenic districts. Softly cradled among the Val D'Agri mountains, you can gaze upon enchanting horizons which never fail to convey unique and unforgettable emotions. It is a peaceful shelter, built to meet the needs of families on vacation, in search of open and safe spaces for their children, and also ideal for all-age couples who simply wish to enjoy days of relaxation. It consists of two guestrooms accurately furnished and polished with a simple, comforting style and a private toilet.